This is an online sanctuary dedicated to the love and service of our Mother God. Our aim is to spread both knowledge and devotion about the oldest form of religion known to humanity—the worship of Deity in Her original form: our first spiritual refuge; our surest sanctuary throughout the ages; our point of origin: our Mother God. We shall be presenting pages about the various goddesses of history: but this has nothing to do with what some patriarchal religions call "polytheism". There is only one Absolute, only one Creatrix: only one Celestial Mother. And yet, through the Ages, She has been known by many Names. There is one Mother God, for She is the Absolute, and there can no more be two Absolutes than a circle can have two centres. And yet She has many Names and many faces, representing Her infinite fecundity and the multiplicity of her Divine Powers and Graces. Her different Names and Forms also correspond to the different characters of the souls She has created. Each of us will respond to a particular aspect of our dear Mother. If we are of an intellectual turn of mind, we may turn to Her as the goddess Athene, Metis or Saraswati. 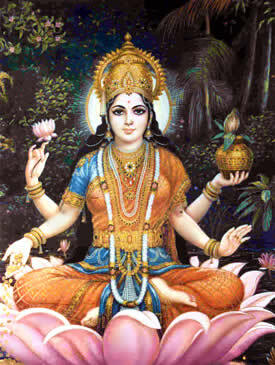 If we our hearts burn with love, divine and human, and the appreciation of Deity through the Divine Beauty, we may turn to the goddess Aphrodite or Sri Lakshmi. In these Goddess Names and Forms, we shall see not merely historical cults long dead, nor merely aspects of our own psychology, but aspects of the Grace and Love of our Mother God. Please play the kinemas below for an introduction to Her faith. 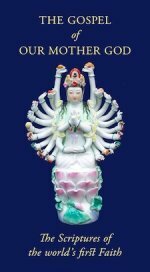 Eastern images of our Celestial Mother often have many arms, and the arms of a mother are made to embrace her children. Whichever of Her faces, whichever of Her Names, whichever of Her loving arms we turn to, they are there for our comfort, our succour and our salvation. We welcome you to this Chapel and hope that we can play some small part in lighting your path back home to our Mother God. NOTE: The following pages are only the main ones. If you want to search this extensive site for a particular topic, please use the search tool at the bottom of the page. Come here for all the latest news for devotees of Our Mother God. A complete introduction to Filianism: the religion of God the Mother - and Daughter. The Ancient Wisdom, or Primordial Philosophy, of humanity is set out for the first time in a concise and systematic treatise that covers all its fundamental aspects. Pagan Religion: was it spiritually superior to the later religions? The catechism for all believers in God the Mother and Her Divine Daughter outlining the fundamental tenets of our Faith. The Wheel of the Year is fundamental to devotees of Our Mother God. The cycles of nature on earth represent both the primal Sacred Drama and a map of the metaphysical cosmos. Durga: how the warlike Face of Our Mother God brought Her worship as Supreme Deity back into the patriarchal world. The Goddess Tara is one of the most ancient and fundamental Names and Forms of Dea. Her famous Tibetan manifestation is only part of the story. Are mythology and folklore two opposed concepts, or does folklore preserve some of the most ancient feminine strata of true Mythos? Is there a feminine Holy Trinity going back to ancient times? We look at the thealogy of the Triple Goddess and feminine trinitarianism. We often hear that modern scholarship has discredited the myth of ancient matriarchy. Has it really? Or is the modern patriarchy rallying to defend its ancient myths? What is the Philosophy Cosmetic? Is there a metaphysical or spiritual meaning to makeup and feminine beautification? Is the worship of the pagan Goddess viable today? If not, what is the worship of Our Mother God? What is Kali Yuga? World traditions agree that time is cyclical and we are now in the last and darkest age. What does Kali Yuga really mean? Pandora's box in patriarchal mythology was the container of all evils, but originally Pan-dora was the all-giving maya. Our Pandora's box is a miscellany of good things. The Labrys has been used by various "goddess" groups, but what is its real meaning? St Cecilia is the Patron Saint of both music and blindness. What does this mean to a devotee of Our Mother God? Hail Mary full of grace - the opening of the Hail Mary Prayer is a definitive invocation of the feminine Divine. A correspondence with a goddess person. What makes goddessism tick? And why worshippers of Our Mother God don't use the g word. What effect does outer space have on our spiritual outlook? We present a fictional analysis of a very real spiritual question. The discovery at Gobekli Tepe of a temple "older than civilization" raises important questions about the current patriarchal historical timeline. As worshippers of the Supreme Mother god, what do we find so wrong about Wicca? What is polytheism? Lady Aquila explains that it is a propaganda-word designed to confuse and prejudice the complex issue the Multiplicity and the Oneness of the Divine. Mary and God. Many devotees see statues of Mary as statues of Our Mother God. Christians see her as a human woman who lived in the first century. Are we even talking about the same Mary? The Day of Sai Herthe falls on the Western New Year's Eve. It is the great feast of the hearthfire and the home. The Feast of Lights, or Luciad, is the beginning of the Easter Cycle in the religion of God the Mother. The Flight of the Silver Vixen may look like a work of feminist science fiction, but it is much more. It is a novel that has an authentic background of devotion to Our Mother God and the Golden Order. Easter/Eastre is one of the oldest names of God the Mother. It is also the Great Spring Festival that begins and ends the Wheel of the Year. Learn all about it. George Lakoff and his research on the universality of metaphor shines an interesting (and unintended) light on the fundamental metaphysical basis of human thought and speech. Answering Dr. Karl W Gilberson: Would Jesus really believe in evolution? An article by Karl W Gilberson suggests that Jesus would believe in evolution because Jesus is truth and so is evolution. Can we spot the fallacy here? Maia is the second month of the year, the "goddess" of spring and the illusion of worldly existence. "Mommy and I are one" is said to express the fundamental desire of the human heart. But is it a regression to childhood, or the innate presence of the first Faith - the worship of Our Mother God? A reader quotes a recent blogger on the view that the worship of Our Mother God "does not feel like a real religion". We examine this question. The Day of Werde is the day when we contemplate our personal fate and the direction of our lives. The Feast of the Dead is one of the Great Festivals in the Calendar of Our Mother God. A feast of fear and separation? Or of love and return? What do we mean by the Anima Mundi and what relation does it bear to the human psyche? An Easter Hymn for Passiontide, expressing the wasteland quality of the time between the Daughter's death and the New Year with a discussion of the nature of our feminine Easter. The Day of Maia is a minor festival dedicated to the all-creative principle of nature. Chelanya begins the Mysteries of Life Cycle and is the first great harvest festival of Our Mother God. Is the Gospel of Our Mother God the true word of God Herself? The Chapel of Our Mother God is a very large site packed with information. From this page you can find a full site-map showing every page, many of which may be hard to find. Send comments, questions or other communications to the Chapel of Our Mother God.